Day 01: Delhi - Leh (leh Palace and Shanti Stupa): Early in the morning transfer to the airport for the flight to Leh, the capital of Ladakh, situated at 3,500 meters of altitude. The flight over the Himalayan range, in a beautiful day, it is among the most beautiful in the world; you can see snow-capped peaks a eye loss among which emerge the peaks of over 8,000 m of K2, del Gasherbrum and other mountains. Arrival and hotel accommodation. It will take a while time to acclimatize as you have moved in a short time from the low altitude of Delhi at the high altitude of Leh. Afternoon dedicated to the visit of the city where modern buildings merge with the crumbling buildings of the old city made of wood and mud bricks. The decrepit Leh Palace, done build in the seventeenth century by the Buddhist king of Ladakh, presents more than a few resemblances to the Potala of Lhasa and the views enjoyed from its roof are truly breathtaking. The shimmering Shanti Stupa, built by the monks Japanese to promote a world of peace. The characteristic bazaar where it is find interesting craft items. Full board. Overnight in hotel. Day 02: UlayTokpo–Experience of Rafting and Magnetic Hill: After breakfast we will start our drive to Ulay( Ule). On the way our first stop will be Hall of Fame- The Army museum will give you a glimpse of Ladakh region and its surrounding. Continue your drive and reach Gurudwara Pather Saheb. This gurudwara is considered highestGurudwara in the World. Continue and Stop at Magnetic Hill – This is a stop on the road where the vehicle goes against the gravity. Our last stop will be Sangam- This is where two rivers meet Zanskar and Indus. The Indus River starts from Kailash Mansarover in China and passes through most of the regions of North India before emptying itself in Pakistan. This is where we will enjoy our adventure river rafting on Zanskar region. The region itself is very unique with immense natural beauty. The Lunch will be served by the rafting people only. Arrive Ulay and check into the Camp which is right on the banks of river Indus. Overnight at the Camp. Day 03: UlayTokpo - the monasteries of Lamayuru and Rizong - UlayTokpo (la "City of gurus") (about 120 km): After breakfast, departure for the monastery of Lamayuru, skirting the great Indus river and crossing villages and green oases cultivated with barley and rapeseed that stand out violently at the bottom of the valleys whose ocher-colored walls they are barren and dry. You reach the monastery of Lamayuru, the "city of the gurus", located at 3,900 meters, one of the oldest in Ladakh and rich in testimonies unique religious services. In the afternoon visit to the rising Rizong monastery. Day 04: UlayTokpo - Leh - Spituk - Chemrey - Takhtok - Leh (the cave ofPadmasambhava) (about 100 km): After breakfast, departure to the east. Stop near Leh for the visit to the Spituk monastery, built in the 15th century by the Gelukpa order, perched on a small hill behind the airport. The prayer hallsthey present beautiful frescoes and imposing statues of protective deities, including Yamantaka, with a bull's head. In the afternoon we continue to the Valle di Chimrey. Visit of the beautiful and well-proportioned ThekchokGompa, built in the seventeenth century, overlooking the village of Chemrey. The main hall of the prayers contains 1000 buddhas, while another hall houses a statue of Padmasambhava 3 meters high. Visit of the monastery of Takhtok, the only monastery Nyingmapa of the upper part of the Indus, whose prayer room is set up in one cave where in the eighth century the great sage Padmasambhava retired to meditate. Return to Leh in the late afternoon. Full board. Overnight in hotel. Day 05: Leh - Thiksey monastery - the Nubra Valley - the dunes of Hundar desert (morning prayers) (about 170 km): Very early in the morning, after breakfast, departure for the monastery of Thiksey, one of the largest and most fascinating in the country, to attend the ceremony of Morning Prayer held at 07:00. Then we leave the pleasant valley of Leh and through the Wari-La pass one descends into the Nubra Valley Nubra is a unique valley where we have different cultures and it used to be one of the major hub of Silk route which started in China and ended in Persia ( Iran) . Evening we will visit Samstaling monasteries. This is one of the beautiful monasteries of Nubra valley and staying place of His Holiness Dalai Lama when he comes to Nubra.Half board. Day 06: Nubra Valley –Diskit – Hundar: After breakfast visit of Disket, the oldest and largest monastery in the valley of the locality of Hundar surrounded by sand dunes of the high altitude desert on which glaciers soar to over 6000 meters. Evening visit Hundar Sand dunes to enjoy ride on bacterian Camel found only in Mangolia and in Nubra or enjoy ATV ride on breath taking slopes of White Sand dunes on your own. Full board. Day 07: Nubra Valley - the Khardung-La - Leh After breakfast, departure for Leh in the direction of the Khardung-La pass which offers, from the top of its 5,603 meters, breathtaking views of the majestic peaks of the Karakorum chain reaching up to 7,200 meters. This is considered the highest motorable road in the world. Stop in a severe environment characterized by perennial snows. Arrival in Leh and hotel accommodation. 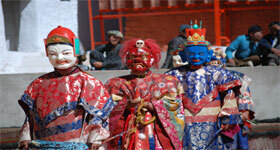 Afternoon we will visit local Handicraft emporium famous for Ladakhi and Tibetian Handicrafts and paintings. Picnic lunch. Dinner. Overnight at Hotel. Day 08 - Leh - Lake Tso Moriri (the "mountain lake" and the nomads)Khampa) (about 240 km): After breakfast, depart south-east to Chumathang, along the river Indo, with a stop at the Upshi checkpoint. Further stop at the Mahe Bridge for continue south-west, along a bumpy road, in a side valley. Yes passes from a remote village called Puga, at the junction for Tso Kar, and passed a easy but very high pass you get to the Tso Kyagar pond, a pearl of beauty, from where we continue to the turquoise lake of Tso Moriri, "lake of the mountains" crossed by the border with China. Until a few years ago the region was closed to foreigners due to the border dispute with China. It is one of the highest lakes in the world (4,500 m of altitude for one area of 120 sq. km, 28 kilometers long and up to 8 meters wide) and is part of a protected ecosystem very sensitive given that in its area live some species of rare birds (crane from the collonero, duck duck, grebe collonero) and a fauna varies (the Tibetan goat, the Tibetan gazelle, the red fox, wild asses of Kiang, a rare species of Himalayan marmot, etc.). The landscape is spectacular with crystal clear waters surrounded by mountains of over 6,500 m covered with glaciers. On its western shore the small monastery of Korzok, old over 350 years old, near the tiny village of the same name. It is the only permanent human settlement since the region is frequented, however the few months to the year in which it is accessible, only by Khampa nomad pastors, of Tibetan origin, which migrate through the Himalayan valleys in search of pastures for their herds of yaks and pashmina goats. Day 09: Tsomoriri: There will be time for explore the surrounding area with a magnificent walk along the shores of the lake. Full board and overnight stays in the tented camp.N.B. These overnight stays occur at about 4,500 m. Due to the high altitude, it may happen that some participants may feel sick (nausea, headache), however limited given the gradual acclimatization of the previous days. For the accommodation in the tented camp of Tso Moriri is need a good spirit of adaptation because the services really are essential, only cold water is available, we recommend bringing a good one winter sleeping bag. Day 10 / Lake Tso Moriri - Puga - Tso Kar - Leh (the "white lake") (approx 280 km): After breakfast, departure for Leh along a path that crosses the most beautiful area of the Rupsu, kingdom of the Khampa nomads; back to Puga and from there going up another valley where there are also sulphurous water sources, one exceeds one high pass that opens onto the Tso Kar basin (4.485 m). With a little luck, yes they can spot kyang, Tibetan wild horses, marmots and eagles. Tso Kar means "white lake" because of mineral residues and salt deposits surround and bring out the shades of blue and turquoise. Here the Khampa nomads for centuries they extracted salt used as a bargaining chip in Ladakh. In near the lake there are some huts, a winter refuge for nomads. Yes it continues westward to the road that comes from Manali. Cross the pass of the Tanglang (5.328 m) and reach the Indus valley continuing to Leh. Full board. Overnight at Hotel. Day 11: Leh - the Hemis - Leh monastery (the Hemis Festival) (about 80 km): About 40 km south of Leh rises one of the most important monasteries of Ladakh, Hemis, famous for its summer festival during which the monks in costumes traditional and with sacred music and cham ritual dances, they recall the success of the Buddhism on pre-existing religion. Hemis was built in 1630 under the Namgyal dynasty and holds the largest thanka of Ladakh that is shown to the public once every 12 years. 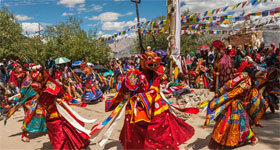 Full day of participation in the Festival of Hemis. Full board. Overnight at the hotel. Day 12: Leh - Delhi: Early morning transfer to the Airport to board your flight back ti your city with the sweet memories of the tour. Accommodation for 11 nights in above advised hotels in the same room category. Transportation by NAC Xylo / Innova and Tempo Travellers for transfers, sightseeing as per the itinerary. 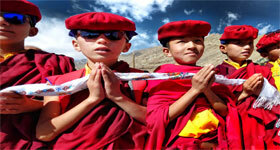 Ladakhi English speaking accompanying guide for sightseeing in Ladakh. Ladakh Environment Fee.Monestery / monument entrance fee. Premium seating included in Hemis Festival. Visit to local House in Ladakh with Tea. The Services of Vehicle is not included on leisure days & after finishing the sightseeing tour as per the Itinerary. The vehicle is not on disposal basis and will run strictly according to itinerary. GST 5% on total Invoice.